"We understand Tamil Nadu's problem. We will see that Tamil Nadu gets water, and will solve the issue," a bench headed by Chief Justice of India Deepak Mishra said. New Delhi: The Supreme Court today agreed to hear Tamil Nadu's contempt petition against the centre for not forming the Cauvery Water Management Board on April 9. Advocate G Umapathy, appearing for the Tamil Nadu government, mentioned the matter for an early hearing. The Tamil Nadu government had asked Chief Justice Deepak Misra to take its petition tomorrow as the centre has not implemented the top court's order on the Cauvery water dispute, though the deadline to set up the Cauvery Board has lapsed. 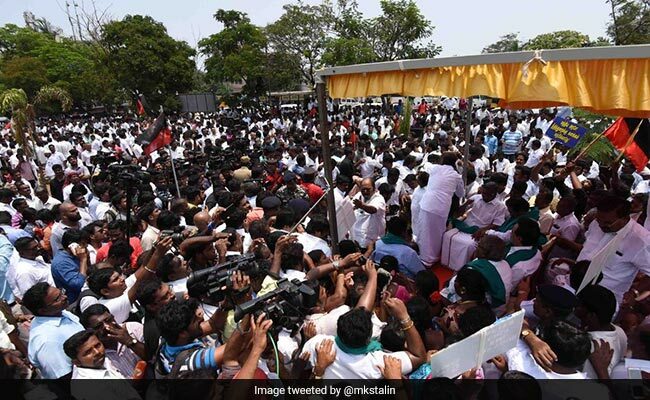 Tamil Nadu's ruling AIADMK had announced that it would hold a hunger strike across the state on April 2, from 8 am to 5 pm, in a bid to mount pressure on the centre to set up the Cauvery Management Board. Senior AIADMK leader M Thambidurai had also said his party would consider moving a no-trust motion in the parliament against the NDA government if the Congress supported it. Over 1,000 persons were detained across the state in connection with protests and were released later in the day, reported Press Trust of India quoting police officials. Rail blockades were staged in parts of Tamil Nadu including Coimbatore, Tiruchirappalli and Pudukottai by the cadres of the opposition parties and pro-Tamil outfits. In Chennai, the demonstrations were held by DMK workers at several places including Saidapet where former city Mayor M Subramanian led the stir. AIADMK to go on a hunger strike tomorrow starting 9 AM. The strike to go on until 5 pm. O Panneerselvam and Edappadi Palaniswami would not participate in the strike. Two DMK workers allegedly made self-immolation bids in Coimbatore today amid a state-wide stir for setting up of Cauvery Management Board at the earliest to implement the Supreme Court's February 16 verdict on water allocation, reported Press Trust of India. According to PTI, the two DMK activists who were identified as PT Murugesan and Singai Sadashivam, doused themselves with kerosene and tried to self immolate at Coimbatore, the police said. 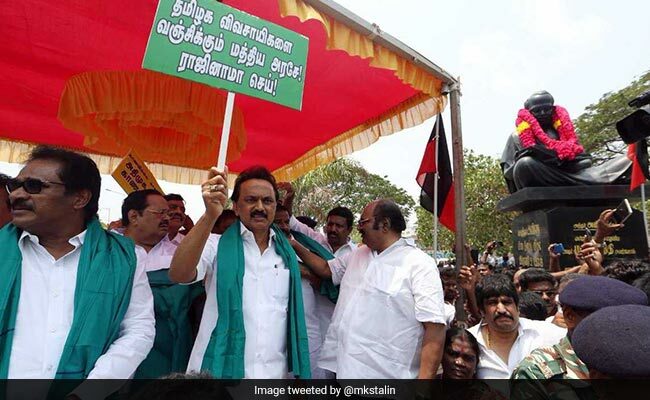 DMK working president MK Stalin who has been actively protesting over the formation of Cauvery Management Board in Chennai had tweeted yesterday that "now our struggle will not stop until the Cauvery management board is set up"
AIADMK lawmakers protested in the parliament premises over the issue. The 9 hour hunger strike across the Tamil Nadu on April 2, from 8 am to 5 pm, was in a bid to mount pressure on the centre to set up the Cauvery Management Board. Senior AIADMK leader M Thambi Durai has said if the Congress party supports, the AIADMK is ready to move no confidence motion against the government on the Cauvery issue. He also said Tamil Nadu's demand seeking setting up of Cauvery Management Board should become a "people's movement" in the state just like the popular stir seeking nod for the bull taming sport of Jallikattu of last year. 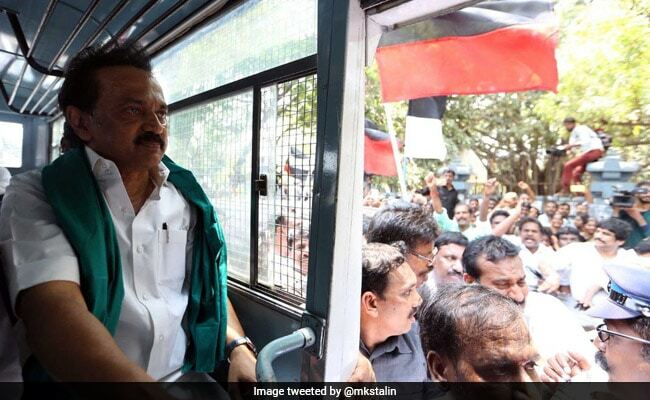 Yesterday, M K Stalin said black flags would be shown to Prime Minister Narendra Modi, whenever he comes to Tamil Nadu, for not constituting the CMB. The court had compensated Tamil Nadu by allowing extraction of 10 tmcft ground water from the river basin. Since the verdict, Tamil Nadu has been urging the Centre to set up the Cauvery Management Board to ensure it received its due share of water from the inter-state river. DMK leader M.K. Stalin was taken into custody yesterday while protesting. Leaders of Congress and VCK parties protested at Valluvar Kottam. A large number of DMK activists participated in the event. Mr Stalin said a statewide shutdown would take place on April 5, blocking trains and buses. 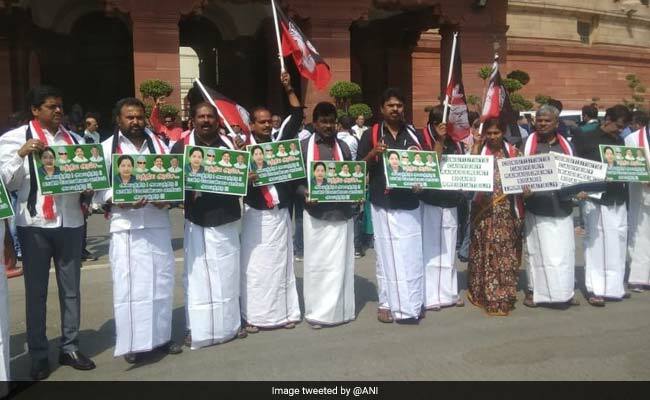 The Lok Sabha has also adjourned till 12 pm after AIADMK lawmakers protested demanding formation of Cauvery Management Board. 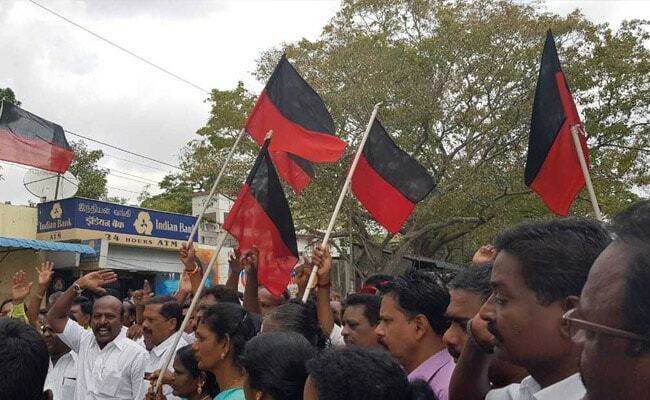 DMK politicians had blocked roads at Chennai's Saidapet and around 200 workers have been detained. The Supreme court had on February 16 raised the 270 tmcft share of Cauvery water for Karnataka by 14.75 tmcft and reduced Tamil Nadu's share, while compensating it by allowing extraction of 10 tmcft groundwater from the river basin, saying "the issue of drinking water has to be placed on a higher pedestal". The Centre had failed to set up the Cauvery Management Board within six weeks of the Supreme court's order of February 16. The six-week deadline ended on March 29. Citing assembly elections in Karnataka, which are due on May 12, the centre had moved the Supreme Court on March 31 on the Cauvery river water dispute, seeking three months' time to implement the top court's order and has also sought clarification on the constitution of Cauvery Management Board. DMK and its allies have decided to organise a 'Securing Cauvery Rights March' from the Cauvery Delta region in the state to Raj Bhavan in Chennai in which leaders of all political parties and the public would participate. 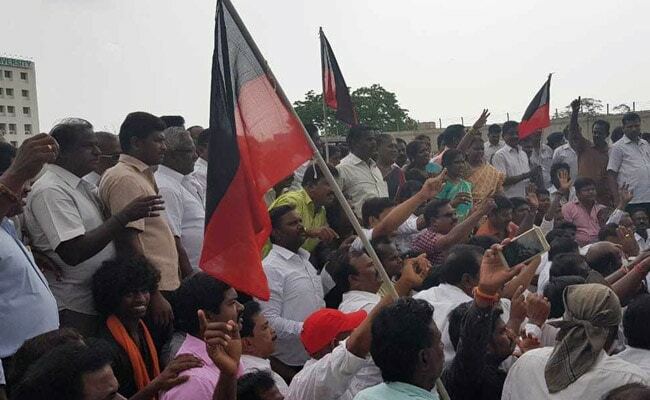 The DMK has been staging protests in Chennai against the Central government for not setting up the Cauvery Management Board as per the Supreme Court's orders. Party members protested in several places in the city which affected traffic. "We will hear it on Monday and resolve the issue," Chief Justice Dipak Misra said.